CIPA's Clip-On Towing Mirror was designed to fit large factory truck and van mirrors. Rubber straps secure the Clip-On Towing Mirror to your vehicle's existing mirror, and easy-to-adjust arms fit tightly for a steady vibration-free ride. The Clip-On Towing Mirror extends your vision further than any OE mirror ever could with a total extension of 7 inches. This mirror will not obstruct your vehicle's existing viewing area. The Clip-On Towing Mirror has a 5 by 7.5" mirror face that widens visibility, in addition to your factory mirror, for peace of mind while towing. It will fit up to a 10" mirror. The Clip-On Towing Mirror is not position specific, so it can accommodate the driver side or the passenger side of your vehicle. Installation is simple and no tools are required. 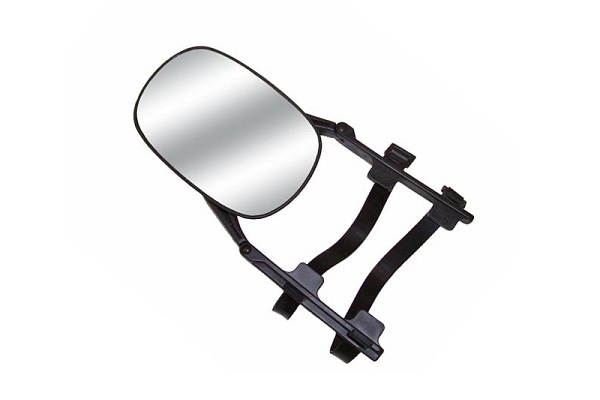 The Clip-On Towing Mirror is perfect for temporary or light towing needs. It is not recommended to be used as a full time heavy-duty towing solution. For best results, remove the towing mirror when not in use, and store in a cool dry place.